Fittings and Tubing Guide is getting part two! 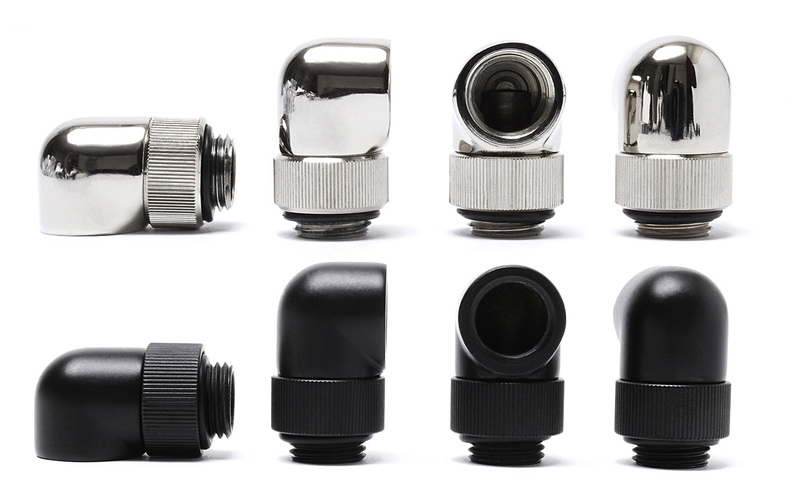 And here it is, our new blog – a “short” guide for all the popular angled adapters, extenders, spacers and the rest of the special connectors. Not everything revolves around the water blocks, radiators, pumps, etc. Those of you who already have some experience in building a custom water cooling systems are familiar with the pain and stress when you are missing only one crucial adapter to complete the loop. But still, we can bet there are water cooling builders who have at least one or two custom loops behind them, who don’t know about all the special adapters that are at their disposal. So, let’s not waste any more “keyboard and bytes” and lay out the basics. 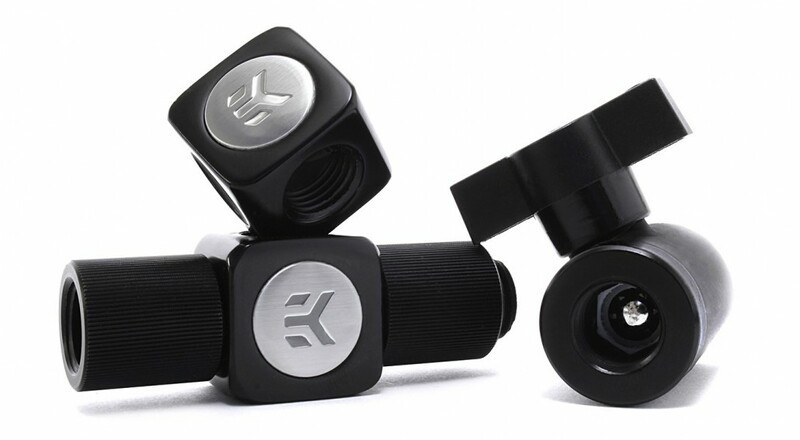 Most of the EK adapters are available in three different “colors” if we can call them that. On the left-hand side, we have the classic “nickel” or “chrome” adapter fitting. On the right, we have the “black” type, and in the middle is so called “black nickel”, that is also referred to as “smoked nickel” or “dark nickel”. Still, the most common ones that can be seen in builds are plain nickel and black adapters. Most important adapter fittings are probably the angled adapters. 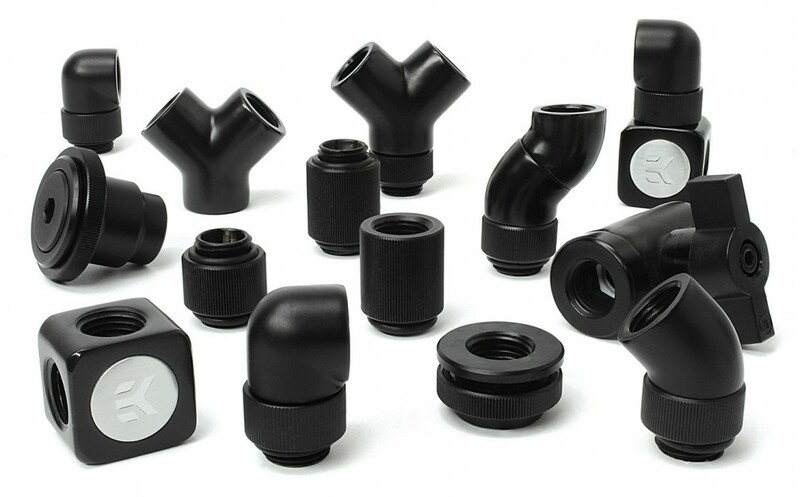 We can distinguish three main types and they are, from left to right, the 90°, 45° and the 2x 45° adapter fittings. These three are all rotary adapter fittings. Rotary fittings are the ones that can rotate – they have the base that gets screwed into G1/4“ port, and the top of the fitting can rotate 360°, full circle. 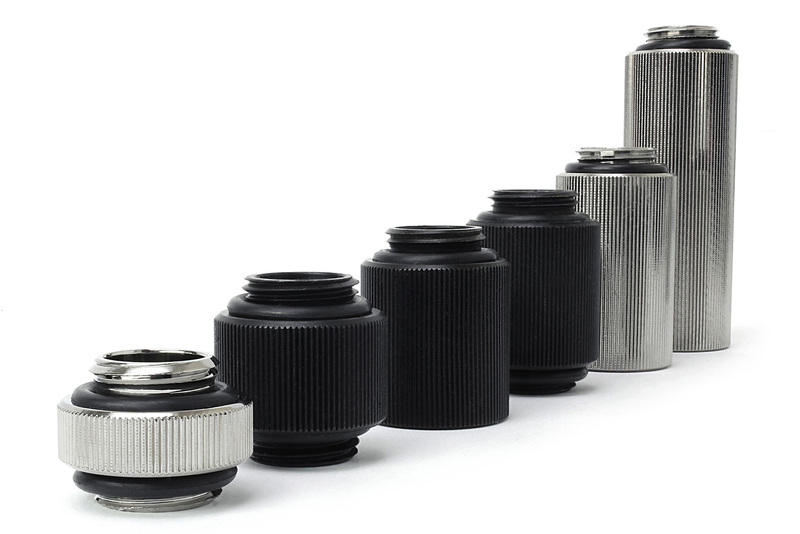 Double jointed rotary fittings, like 2x 45° adapters, are very useful if your components are slightly misaligned, but also in many other situations as well. After all, the 2x 45° rotary adapter can be used as a 90° fitting with a slightly bigger arch. How do rotary fittings work? How can they rotate and still not leak? Well, as always, we like to demonstrate things in high detail. Therefore, here is a cross section of a 45° rotary adapter. As we said, there are rotary adapters and the ones that cannot rotate, called fixed adapters. In the following photo, on the left side, we can see two static extenders, while the two on the right are rotary extenders. 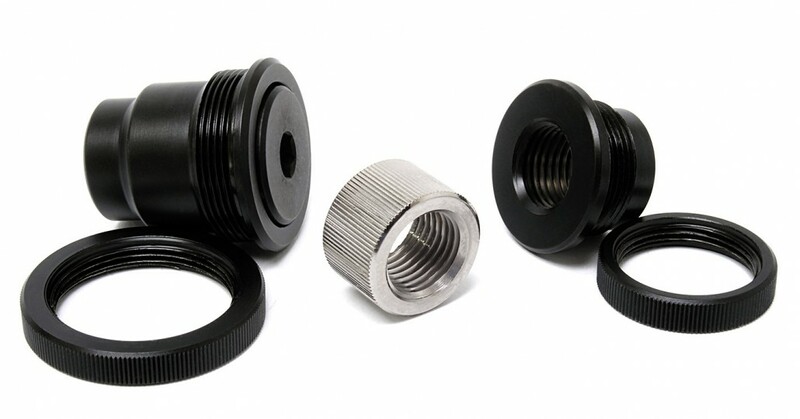 Everyone can inspect the outer elements of the adapter fitting: it has a female G1/4“ inlet at the top, an O-ring and a male G1/4“ thread at the bottom. But here you can see what is happening on the inside, and it is actually quite simple. Two O-rings allow the rotation while preventing leakages. The third component is a steel ring that prevents the top part being separated from the base. Static extenders can be really short, just 6mm, and up to 50mm in length. 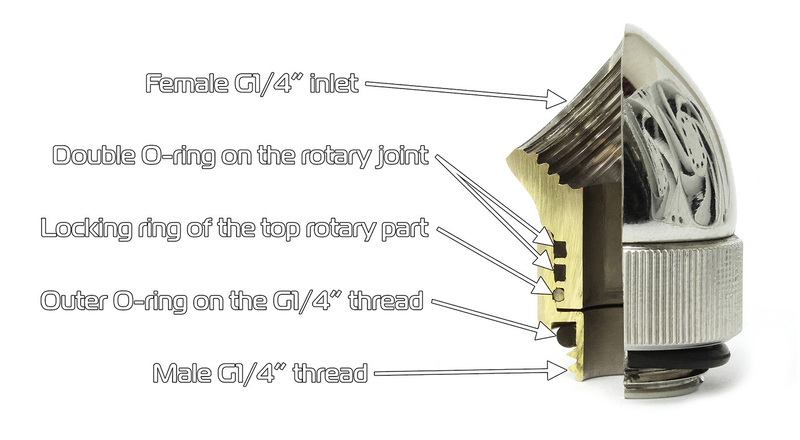 Both fixed and rotary extenders come in versions that have male/female and male/male G1/4” ends. Two components can often happen to be too close to one another, and both soft and hard tubings have a limit of the radius at which they can be bent. In these cases, the use of angled adapters is necessary. One of the greatest features that EKWB can be proud of is the option to tighten and release the adapters with a size 9 Allen key. All of our static extenders have this feature that allows you to safely tighten and unscrew the adapters without damaging them from the outside. Spaces and fittings sometimes end up being screwed in too tight, and the only way to release them is with some pliers, which is a sure way to damage them. But with using an Allen key on the inside of the adapter, you are preventing any aesthetical damage. The feature and compatibility with the Allen key is extended to both our HDC fittings and barbed fittings as well. But unlike some other companies (on the left) that use size 8 Allen key, EKWB (fitting on the right) uses bigger holes that are compatible with a larger, number 9 Allen key, so that high flow rates remain unharmed. Moving on to the next subject, to talk about ball valves and splitters. These two types of special connectors are usually used together. Since every intervention in a water cooling loop requires the system to be drained, what other thing can be more ideal for that, than a ball valve? 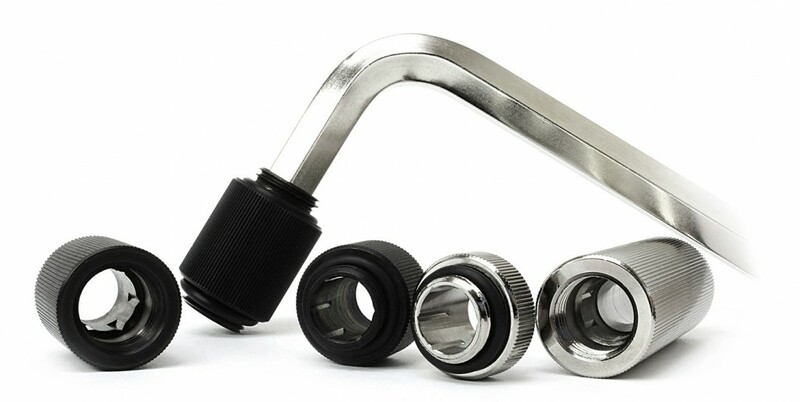 By using a T-Splitter, you can implement the ball valve wherever you find it the most useful. 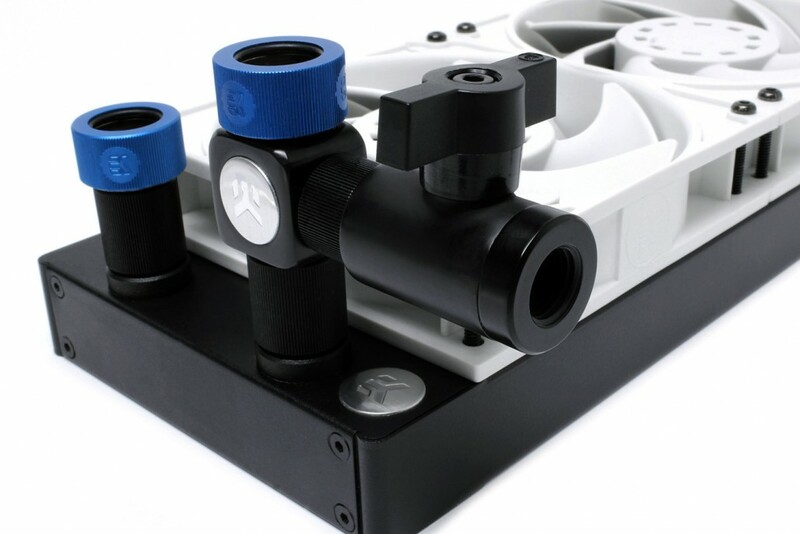 Valves for draining the system are best mounted somewhere at the lowest point of the cooling loop. As for the splitters, we can mention three basic types: Y-Splitters, X-Splitters and T-Splitters. 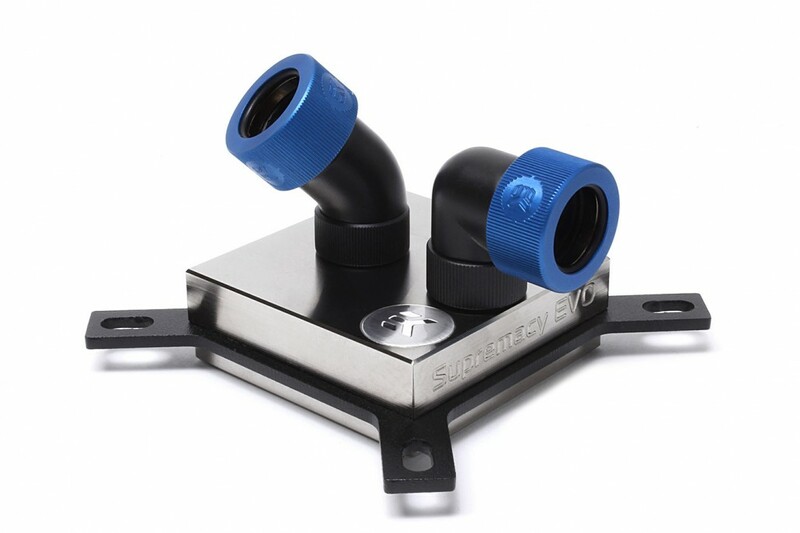 These splitters, among a very wide variety of appliances, can enable the user to build a liquid cooling loop without a dedicated reservoir. These systems are referred to as “T-Line” loops, and they are more demanding during filling and maintenance too. The next three components we are going to cover here are the FillPort, the panel mount Pass Through and simple but useful female to female 12mm spacer. The name “FillPort” is quite self-explanatory. 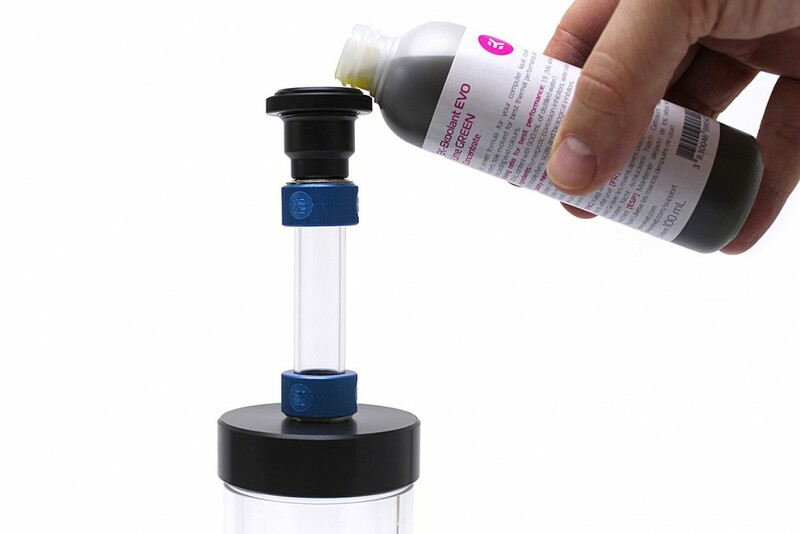 It’s an airtight seal that you can open and fill up your loop, add coolant additives, etc. Your FillPort can be connected to any part of your loop via soft or hard tubing, whichever works for you. The diameter of the fill port is 25mm, so anyone can drill a hole on the top of the case and install it. The female to female 12mm spacer and the pass through are almost the same things. They both have a female G1/4“ inlet on both sides and can be used for joining other adapters and fittings. The Pass Through can be installed in a 20mm diameter hole and probably the most common way of using it is when you are building a multi-chambered PC. 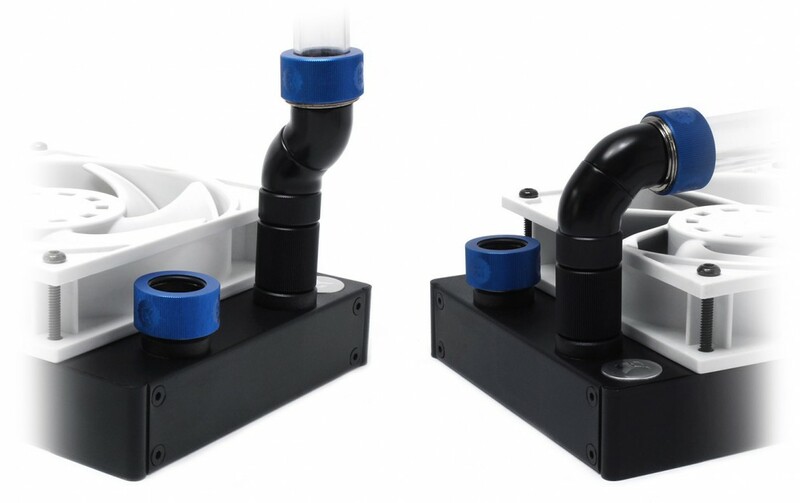 In cases with multiple chambers, the panel mount pass through can be used to switch hard tubing to soft tubing while passing through the motherboard tray or similar walls. A lot of cases already have holes on the back for external water cooling, therefore, the pass-through port can be used in the same manner. And there you have it! That’s our little army of angled adapters, extenders, spacers and special connectors. They are not necessary, but they are here to make your life easier when building a liquid cooling loop. In fact, anyone who has already built at least one loop will tell you to put one or two 90° fittings in the basket while shopping for your liquid cooling build. Fantastic Guide. I wasn’t aware of the allen wrench feature on your fittings despite being an owner of MANY EKWB products. The case or mid-plate pass-through is also something I’ve been looking for and if it weren’t for this well illustrated guide, the search would continue. Thanks for your continued dedication and commitment to the arts of cooling. Project Shark by Tiche PC Customs How to choose the right liquid cooling kit?